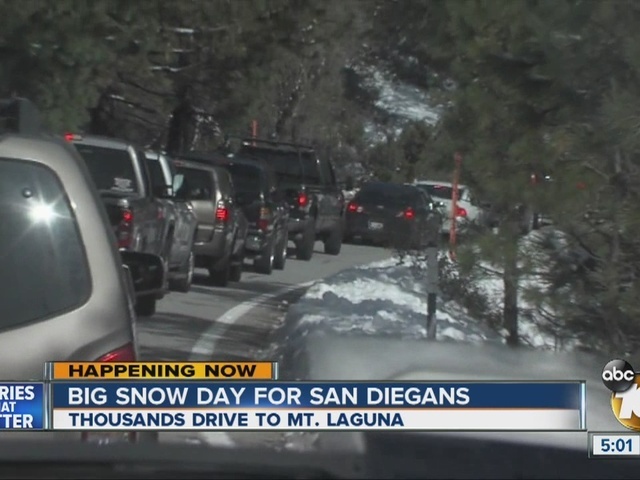 Traffic was jammed for miles on Sunrise Highway as thousands of people drove up to Mt. Laguna to play in the snow. The California Highway Patrol closed Sunrise Hwy. at the I-8 up to the mountain at 2:45 p.m. because there were too many cars. Families were stuck, sitting in their cars in bumper-to-bumper traffic on a two-lane road for miles. It was frustrating for Susana Vasquez. “Yeah, kids want to get off already and play with the snow,” Vasquez said from the passenger seat of the stopped car, with her kids in the backseat. When cars came to a standstill, which they did often, kids jumped out of cars to play in the snow, then got back in when the cars started moving. At certain times you could walk faster than the cars were moving. People stopped everywhere along the highway to play, at times trespassing on private property. U.S. Forest Service officers kicked hundreds of people off private land and directed them back to public play areas. Big crowds are expected again in Mt. Laguna Sunday.